Boba Fett - dedicated to the hunt. No Bounty Hunter in the Star Wars universe is as dedicated to the hunt as Boba Fett. 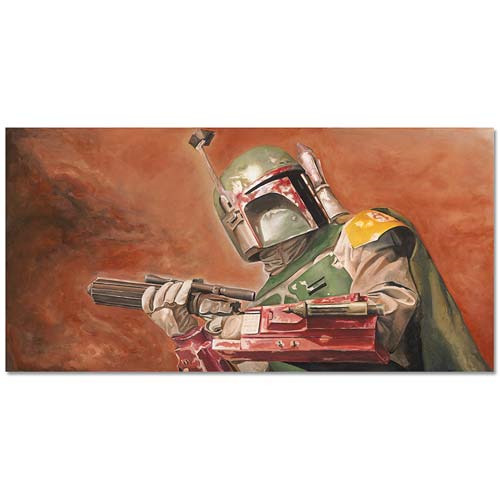 This Star Wars Boba Fett Relentless Canvas Giclee Print pays homage to the Mandalorian's chutzpah and features an image of Boba Fett with blaster in hand, looking intently for his prey. Measuring 28-inches wide x 14-inches tall and printed on canvas, this beautiful piece of artwork has been hand-numbered and signed by the artist, Greg Lipton. A limited edition of 95 pieces, this fantastic giclee print even comes with a certificate of authenticity.